I adore these cookies. Don’t let the oats fool you into thinking that they aren’t delicious. They look deceptively healthy, but this is shortbread we are talking about. There is plenty of butter in them, I promise. Essentially, this is a shortbread that uses mostly oats instead of flour–genius idea, if you ask me. All you need is one bowl, one pan, and a handful of ingredients. 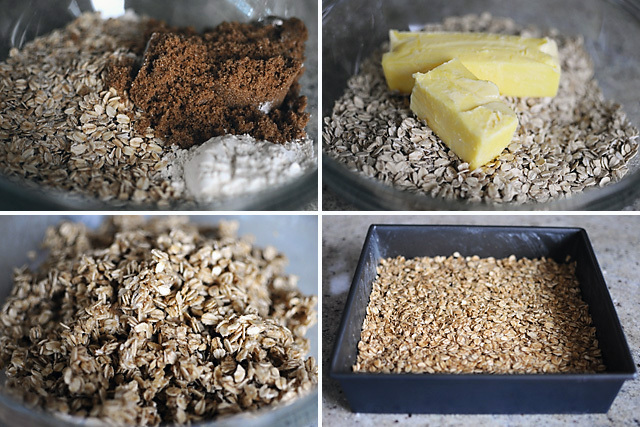 First, you mix all the dry ingredients together–oats, brown sugar, flour, and salt. Then you work some butter and vanilla extract into the dry ingredients (I just use my hands), press the mixture into a buttered pan, and bake. 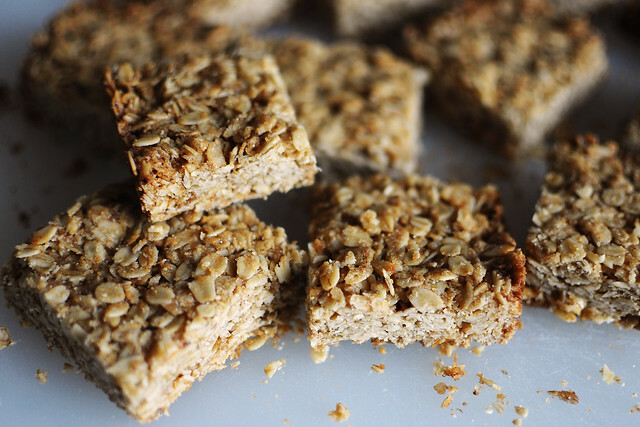 The end result is a shortbread that is a cross between a granola bar and a cookie. Because of the oats, I like to call them breakfast cookies. I find myself eating them on their own or crumbling them over yogurt for breakfast. By the way, I really encourage crumbling. The crumbs turn into the most delicious granola–great with yogurt, milk, or even vanilla ice cream. Heat the oven to 350 degrees and butter a 9-inch square pan. In a large bowl, mix the oats, brown sugar, flour, and salt until well mixed. Add the butter and vanilla and use your hands or a wooden spoon to work all the ingredients together, until the mixture is uniform and crumbly. 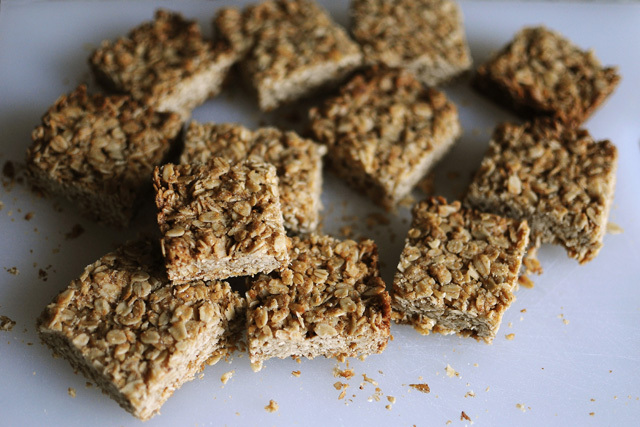 Transfer the oat mixture into the prepared pan and use your hands to press the mixture into a smooth even layer. Bake for 20 to 30 minutes, until golden on top. Cool completely in the pan before cutting into squares. Note: If you cut into the shortbread before it has cooled, it will crumble into a pile of crumbs. If this happens, just call it granola instead of shortbread.